Sometimes we forget there is more to the movies than entertainment. Sometimes, it seems, we forget that there can be more to a story than information, simple insight, or distraction, but rather that a story can genuinely move you. I mean, truly move you to the point it inspires a change in mentality, a refreshed outlook, or even just a slight alteration in compassion. As sappy and excessively sweet as it may sound that is what Wonder does. It is a movie that has all the trappings of a melodramatic dramedy that plays on the sentimentalities of the audience in false ways and if you're a seasoned movie-goer of any kind it's easy to see why this would be pinpointed as such. The trailers and other marketing material have made Wonder look like something that ranks somewhere between a Hallmark made-for-TV movie and an after school special that serves to show children the repercussions of bullying, but walking out of the theater it is beyond evident that this movie is so much more than these dismissive descriptions would have you believe. Wonder never succumbs to the sappiness of it all, but more importantly is when it does reach for its peak emotional moments or dare to try to move the audience-it owns it completely. Wonder is a movie aware of what it is meant to do without being self-aware in the slightest. The word is humble. Wonder is a movie that defines being respectable without having to feel like it needs to announce its importance; it just is. Manipulative by nature, but unassuming and wholly modest in its execution writer/director Stephen Chbosky (The Perks of Being a Wallflower) finds the perfect balance in understanding the specifics of what his movie is intended to accomplish while making the audience wholly aware of it without flat-out exploiting their emotions. As a dad though, this thing hit me right where it was supposed to and while I understand that what is presented on screen is to a large degree a completely manufactured world where the schools are exaggerated, family time is strictly mandated, and there seems no financial concerns whatsoever these are also all things that aren't critical to the main idea and morality that the film is trying to convey and much can be forgiven when your movie promotes a simple idea like kindness this well and moves you this effectively. 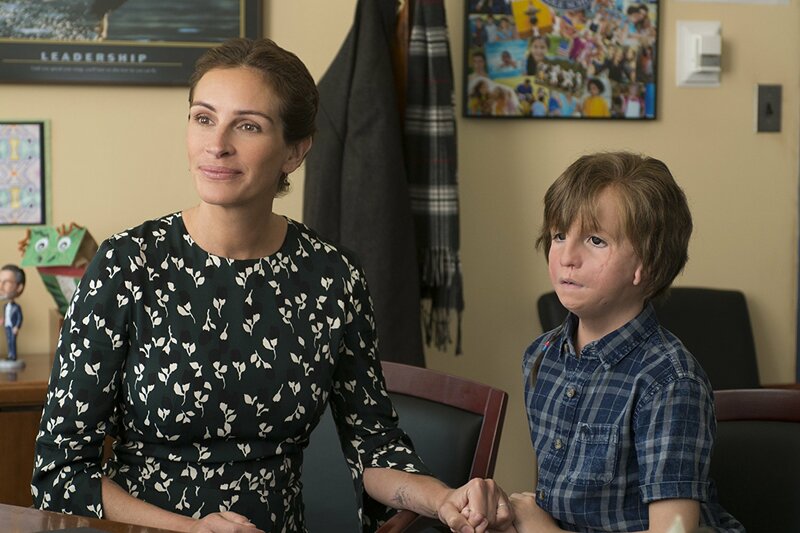 Isabel (Julia Roberts) has some hesitations about sending her son, Auggie (Jacob Tremblay), to public school for the first time. The first time I heard about Wonder was in a text from my wife asking if I'd heard anything about an upcoming movie called Wonder. I hadn't, but I was curious as to why she all of a sudden seemed so eager and excited when anticipating movies wasn't typically something she made a hobby out of. Turns out my wife, who is a high school librarian and reads A LOT, was in the midst of the novel of the same name that this Stephen Chbosky adaptation is based on. The book, a New York Times bestseller by author RJ Palacio, is by all accounts a solid piece of work that is genuinely moving and heartfelt as the wife described it as a work that nearly every middle schooler she encountered had read with some teachers even electing to teach the book as a part of their curriculum. This speaks to the resounding positivity of the book and how much it has resonated with the generation first introduced to it while also speaking to its popularity. While I personally only read the first three or so chapters for nothing other than lack of time prior to seeing the movie it is fairly evident from the get-go that screenwriter Steve Conrad (The Pursuit of Happyness, The Weather Man) as well as Chbosky were keen on giving the material an accurate presentation as not only does Wonder, the movie, remain candid and conscious of itself in terms of the characters understanding where they stand in their family and in society, but a few title cards hint at the approach to structure the film will have which, while I knew the book utilized multiple perspectives, was somewhat surprised the movie decided to adapt this aspect as well. 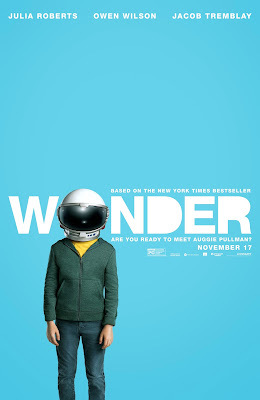 Given Wonder is essentially about a boy with a physical deformity front and center on his face who is tasked with going to public school for the first time in his life as he gets ready to embark on the fifth grade it would seem that the film might elect to solely follow our protagonist's journey with anecdotes filling in the exteriors that concern those in his family as well as the friends and enemies he inevitably males. By not doing this though, Chbosky makes it clear that he isn't interested in only how August Pullman, Auggie for short, deals with his deformity and the life that comes as a consequence of it, but how as much informs the lives of those around him. It's a tool to better demonstrate that this isn't a black and white situation of bullies and victims or of good and bad, but a world of opinions and perspectives that can draw everyone to different and/or opposing conclusions even if all anyone wants is the same peace and happiness. 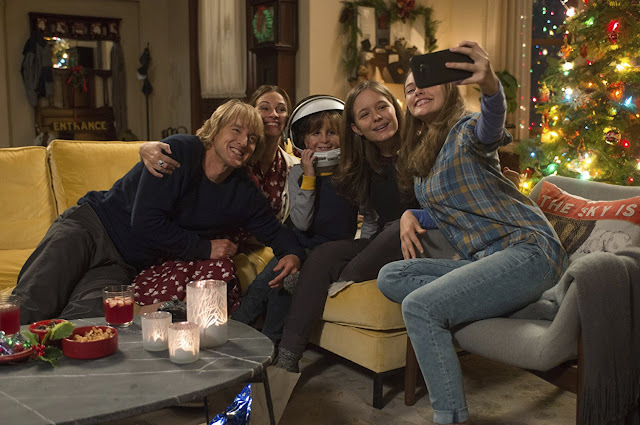 As Auggie, Room's Jacob Tremblay is certainly still the star of the film, but Auggie is as much a reminder of the kindness that needs to exist in this world as his sister, his father, and his mother come to be. As he did in adapting his own work with Perks of Being a Wallflower, Chbosky is able to take a broad canvas of potential emotions and narrow it down to the specifics of those characters whose lives his film is zeroing in on. This is always the best alternative when it comes to dealing in movie that carries a lesson or reminder as the face of what the audience is being told is more than obvious, but by dialing the details back to certain individuals and chronicling how we each tend to deal with daily struggles Wonder automatically becomes more personal. Beginning with Auggie, the film allows the audience to be privy to the anxiety he feels about going to school for the first time along with the lack of transparency he picks up on when dealing with his parents, Nate (Owen Wilson) and Isabel (Julia Roberts), and their opposing views on if sending Auggie to public school at this moment in time is the right decision. Auggie isn’t an only child though, despite the fact his older sister, Via (The Foster’s Izabela Vidovic), sometimes feels as if he is. Initially we peg Via as one of the most understanding humans on the planet, just as her parents do, but we soon come to understand the extent of the pain and loneliness she is feeling. Vidovic never makes Via the archetypal scorned other sibling who comes to resent her younger brother though, but instead Via goes and reaches her breaking points in quiet away from those she loves because it’s true-she understands why things are the way they are and is compassionate to that fact. As the narrative continues, Via becomes one of the more engaging characters for the layers that are lent her in terms of her own friendships with Miranda (Danielle Rose Russell) and its inherent drama as well as a budding relationship between herself and fellow dramaturge Justin (Nadij Jeter). It is in Via’s thread that Wonder especially reinforces this idea that there are not only two sides to every story, but that there are often many shades of gray to both sides. We are given Via’s perspective on her little brother, but are pulled into her issues with Miranda only to also be given Miranda’s story which ultimately comes to be something not so easily pegged and specific to the point it's more honest than might be expected from a movie that is coated with as much sweetness as the façade that has been painted upon Wonder does. The same is true of Auggie and the friends he eventually encounters at school that include Jack Will (Noah Jupe, who was one of the two redeeming qualities in last month’s Suburbicon and is so obviously destined to be a movie star), Summer (Millie Davis), as well as class bully Julian (Bryce Gheisar). Julian may not necessarily come to be more than we think he is, but the movie brings more understanding to why he is the way he is. This is all to say that Wonder may initially seem little more than surface deep with its outwardly schmaltzy premise and spotless aesthetic, but the more you get to know the characters the more it seems this was done intentionally so as to reinforce that basic principle of not judging a book by its cover. The Pullman's share a moment during the holiday's in Wonder. Furthermore, a key point in Wonder’s success is also knowing its own limits. Never does Chbosky attempt to go bigger or deeper than he needs to which, either way, might have veered the film into confusing territory tonally. Rather, the writer/director utilizes his all-star cast and inherent charm of the well-intentions the film carries to take his film through to its genuinely affecting conclusion. Full disclosure: I didn’t necessarily expect Wonder to be a bad movie and I certainly thought it seemed to have the potential to be an inspiring tale in ways that had been done and seen before, but never in a million years did I think that it would give me the type of gut punch that it does in the third act when a key moment happens that includes the whole of the Pullman clan and specifically Roberts’ Isabel having a moment of clarity and realization that is something I tend to struggle with on a daily basis. It is this thought of time, of actual quality time, and the impression, and vitality of spending time with your family and your children that wracks a parent with constant guilt and concern. What is enough? What is too much? When being present am I the best version of myself I can be for them? Roberts communicates this flood of emotions in a single look and an isolated moment that Chbosky and his editor cut together expertly so as to accomplish that balance of nailing the idea that needs to be communicated without stating it explicitly. In light of this it should also be noted just how good movie star Julia Roberts is in this role and I reiterate “movie star” Julia Roberts exactly for the reason of saying that if anyone ever needed proof as to why Roberts has been a staple of Hollywood royalty for so long now, Wonder is a fine example of just that. And while I wish the movie would have given Wilson more to do (or at least told us what the guy does for a living) it is something of an unspoken understanding from the outset that, as the stay at home parent, Isabel is the one who factors more strongly into the minds of her children and it is her approval, her attention, and her love that is almost more meaningful than that of the goofy dad who makes sure everyone is taken care of and always has something to laugh about. That isn’t to say Wilson doesn’t fit this specific bill perfectly, he does and is growing into roles such as this quite nicely, but knowing that the actor is capable of more while not having the opportunity to show as much in a movie like this is a little disappointing. Both Mandy Patinkin as Auggie’s principal and Daveed Diggs as Auggie’s homeroom teacher should be noted as well as both have key scenes that could have played as little more than mawkish, but both come across as times you want to literally stand up and cheer. Of course, Wonder has a few shortcomings in the form of one too many tacked on endings and a fight scene that plays completely false, but again this is a movie that clearly states what it is and what it wants to teach you while simultaneously being an introspective and sensitive piece that states and tells its audience these things in the most earnest fashion possible.